I’m partial to the built-up header option. The problem of course is that the shadow will be cast a certain direction on the original texture/image but when you render it out the light source may be the opposing direction which will make things look a bit off. 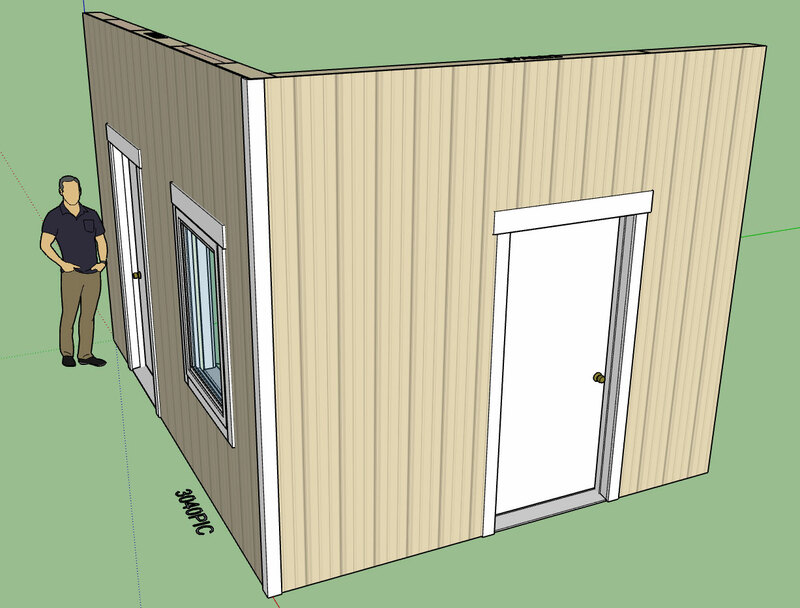 Modeling the actual texture/profile of the panel is not a good idea either since it would make the model very heavy. - Enabled built-up headers within the window draw and edit menus: None, Top, Bottom or Both. - Added the built-up header parameter to the Windows tab of the global settings. The window to the left is a good example for where the top plate is not needed, just the bottom plate. as the header butts up directly against the top plate of the wall. 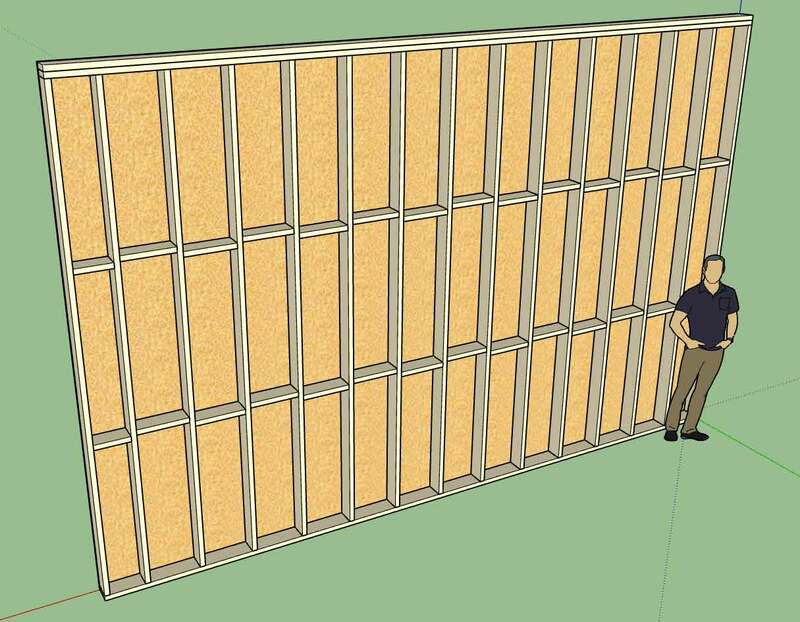 The window to the right is set lower in the wall and requires both top and bottom plate as shown. The built-up header parameter allows four options: None, Top, Bottom or both. The default behavior can also be set in the global settings. As with the custom widths on the trimmers and kings I am test bedding this with the windows first, once everyone has had a chance to work this through a bit I will roll it out for doors and garage doors. I agree, there are a lot of variations on these built-up headers. The way I'm currently showing them is with the void to the interior side of the wall so that this space can be insulated prior to the installation of gypsum. However, I've also seen headers where the 2x lumber sandwiches a piece of foam to create and insulated header that way. 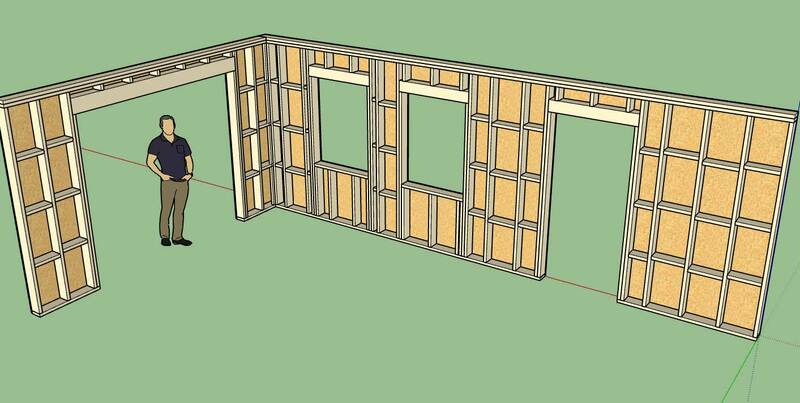 I've also seen 1/2" or 7/16" OSB alternating with 2x material so that the final thickness is equal to the wall depth (3.5" or 5.5"). I will need to give this some further thought. Headers are actually quite complicated, given the myriad of ways one can put them together. The model was created with all three plugins. The only manual edit was moving the person outside of the structure and re-positioning of two anchor bolts that landed in the middle of the garage door. 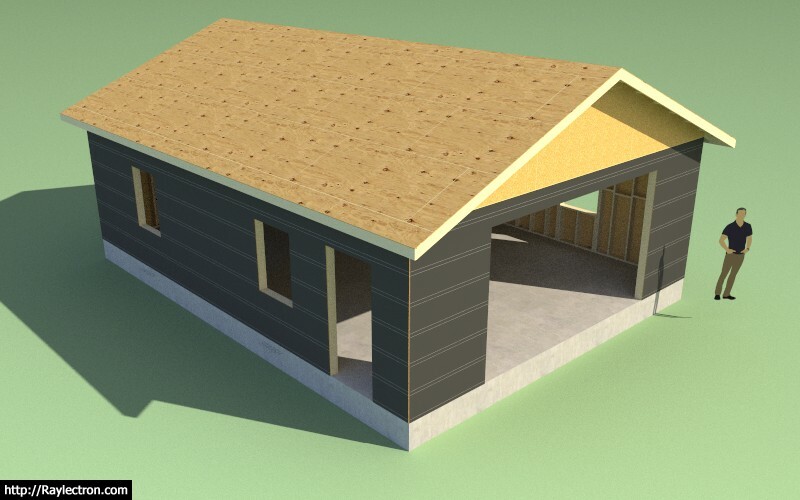 The entire model except for the foundation (slab-on-grade) is fully parametric, moving openings or changing the roof pitch is a couple clicks of the mouse. Model creation time was about 10 minutes. As far as speed of modeling goes I think this is starting to close in on other design packages like Revit and Chief Architect. Once I add the estimating and then the engineering it will even exceed their capabilities. A whole different area I really haven't explored yet is fixtures (and furniture). Technically this is a very broad topic and could really use an entirely different plugin to do it justice. 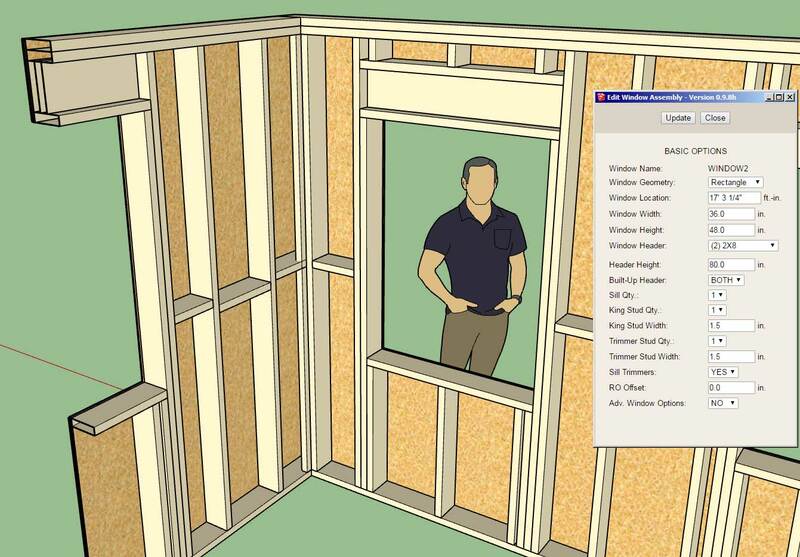 However, I will add in a toolbar called "Fixtures" which will allow the user to select from a matrix of options (Bath, Bedroom, Kitchen etc...) and then to select from some standard layouts. 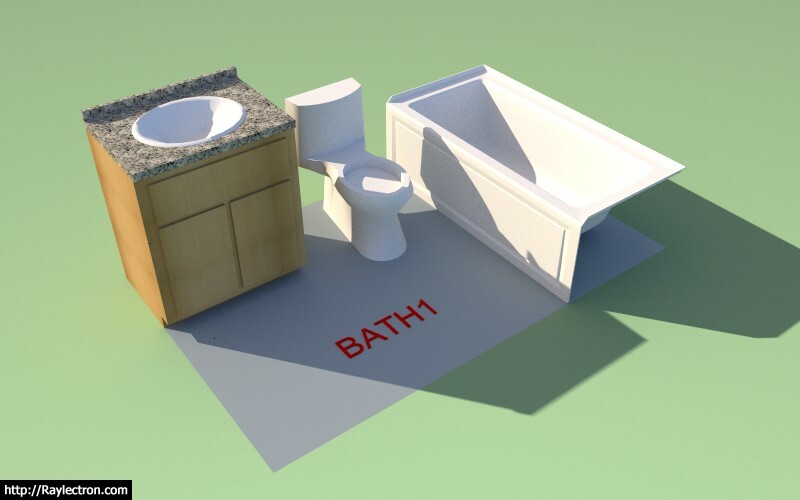 An 8'x5' bathroom with a sink, toilet and tub. The idea being that the user can quickly generate any standard layout from a library of components. I will probably include a few default (low poly) components however it will be up to the user to drop their own preferred components into the plugin sub-folders if they want to be able to select from them in the drop down menus. I don't want to include a large number of high poly count components in the plugin because is will make the .rbz file too large and cumbersome. Besides there are vast libraries of manufacturer components available in the 3D warehouse. The Edit menu will allow the user to swap out any of the components and also custom position them as required. 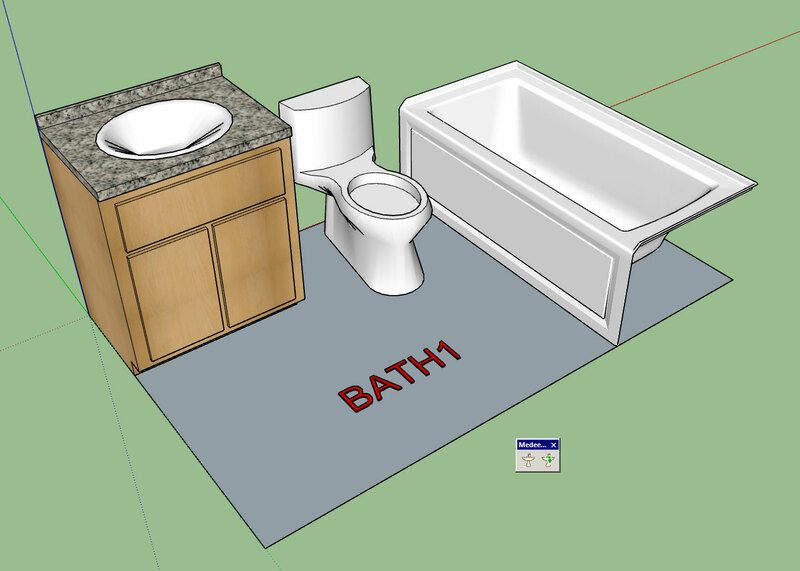 For this particular bathroom layout (and most layouts in general) there is a left and right hand orientation. 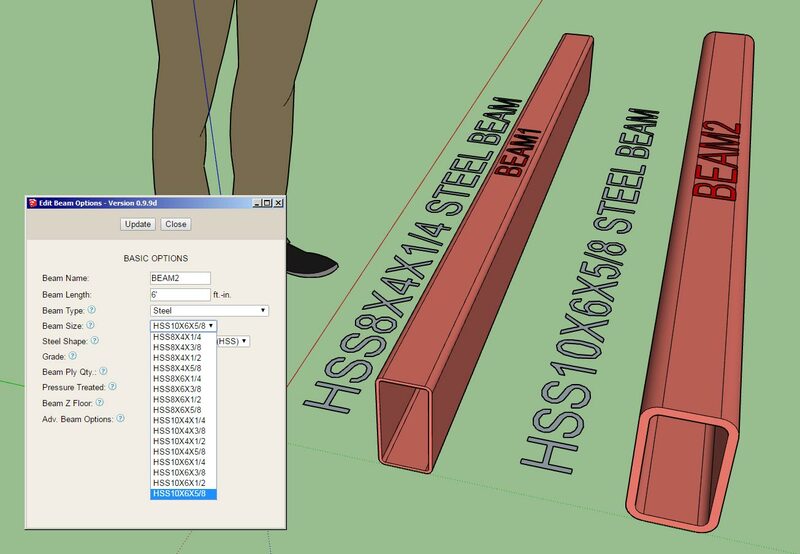 The user will be able to select the orientation in the draw and/or edit menu. The first mouse click will establish the insertion point the second click will establish the rotation. Clicking the shift key will toggle orientation (left or right). Some fixtures such as the bath tub shown come in a left and right version. It will be up to the user to upload both versions for use however I will include an additional parameter (rotation: 0 or 180) so that orientation can be controlled. 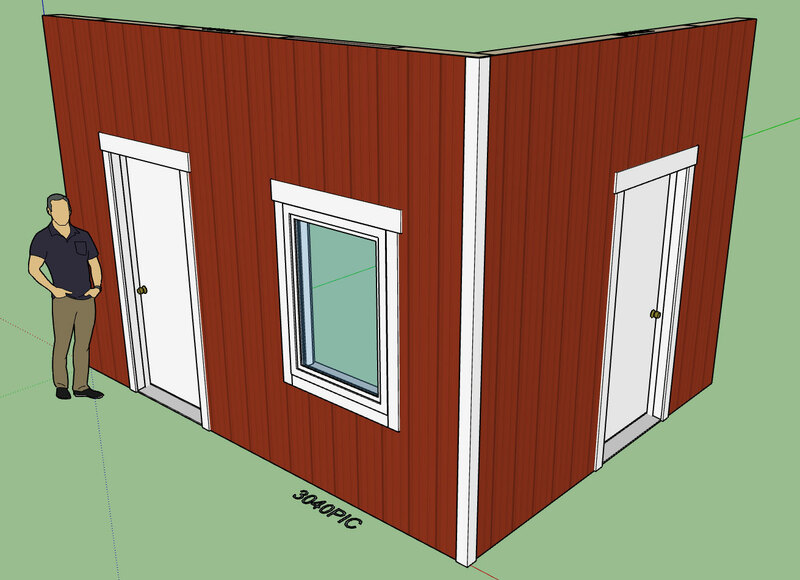 With this new module I will start with bathrooms first and then branch into other rooms as the need arises. Not really in love with my low poly toilet, it looks like it is flooded. - Added a material parameter for ext. wainscot ledges. - Added toolbar icons for "Fixtures" module. This extra parameter was added per customer request. 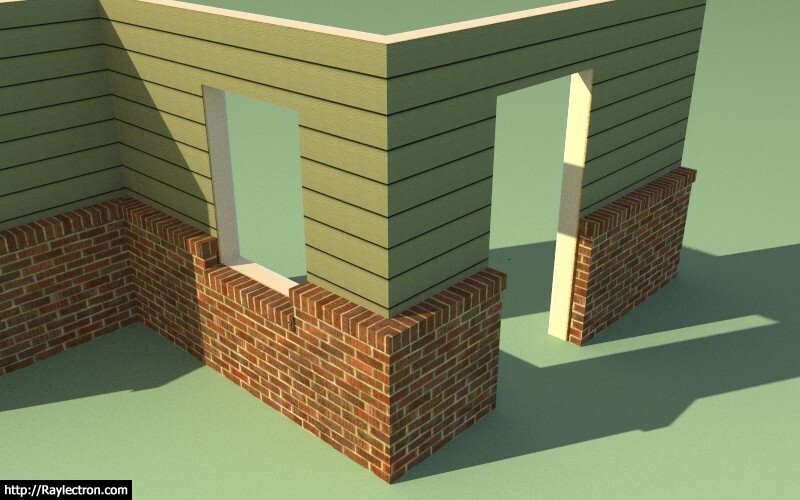 This will allow the designer to setup a texture/material for rowlock brick. P.S. The rowlock brick material shown was created from the regular brick texture. I then added it into the Material Manager, so that it will be available by default (Version 0.9.9e or greater). - Fixed a bug (metric) for window and door grilles in the global settings. Note that this is a critical fix for Windows 10 and Mac users. The intermittent response times of the google ads was causing issues for the HTML menu pages of the global settings so I decided to completely remove all advertisements. The vertical parameter that already exists will position the first row vertically in the wall and then the next rows of blocking will be arrayed upward by the row spacing and number of rows. For now I am omitting blocking over and under opening but that will probably need to change with multiple rows of blocking. Multiple rows of blocks is going to get a bit heavy in the model but you have to give people what they want. 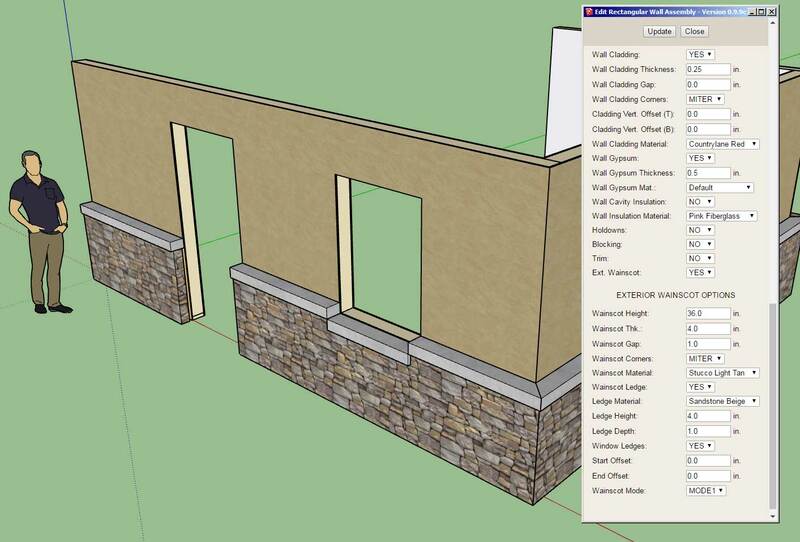 - Added two additional parameters for mid-span blocking to enable multiple rows of blocking in a wall panel. - Added two parameters (number of rows, row spacing) for blocking into the Walls tab of the global settings. There may be an issue with previously created wall presets due to the addition of more parameters to the wall panel dictionary module. The number of parameters now stored for a preset is 97. 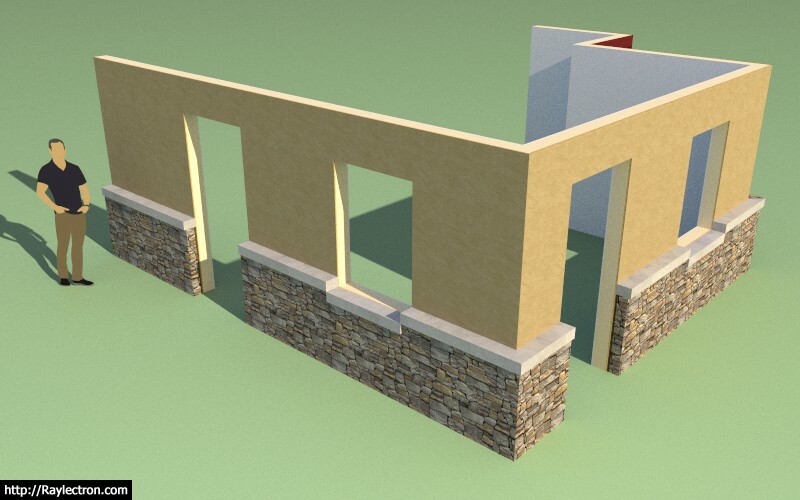 I am also wondering if anyone would be interested in having me publish the attribute library for the wall panels. 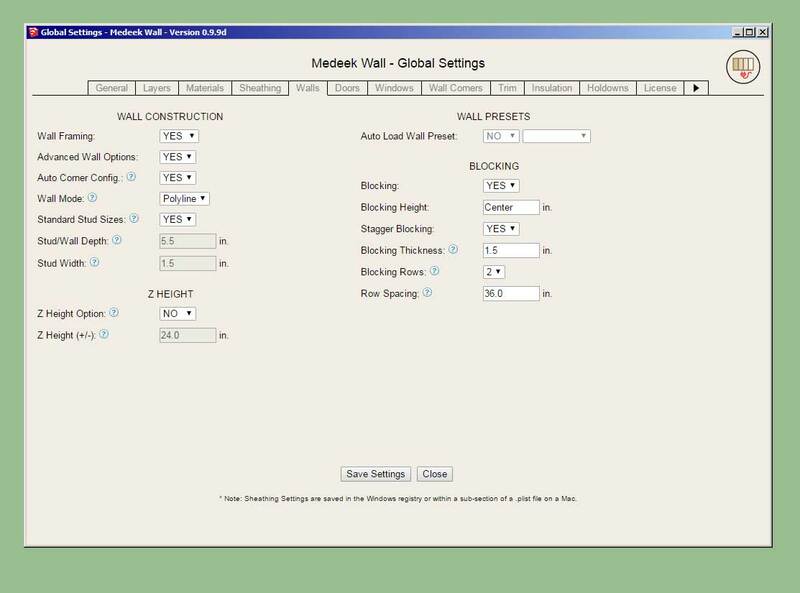 This would allow other developers to potentially access and modify the Medeek wall panels with their own plugins or have their plugins interact with the Wall plugin. I also spent some time cleaning up this module a bit today and tightening things up. It's amazing how you are able to condense your code when you spend a few minutes and really work at it. 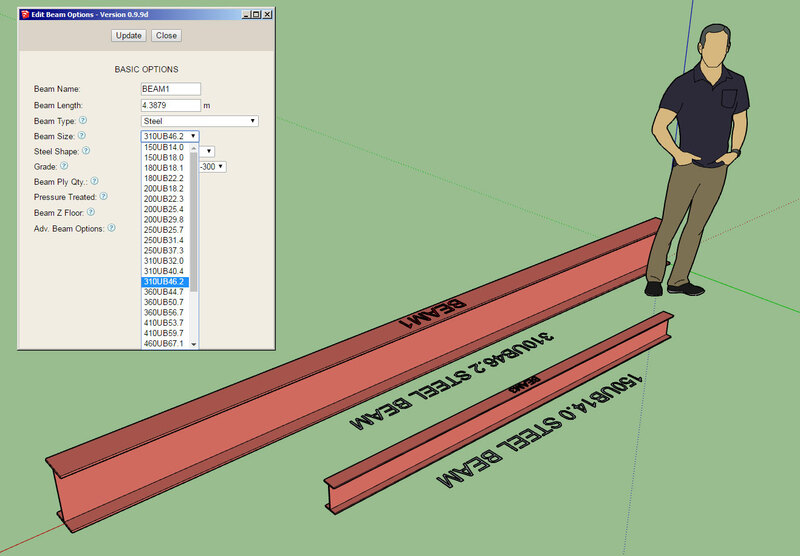 I've also made it much easier to add in new schedules/lists of different beam types and sizes. I still need to add in many more beam sizes for the metric world (or just make it completely open ended so the user can define their own sizes). - Added hollow structural section beams (HSS) to the beam module. - Added angle iron (L) beams to the beam module. 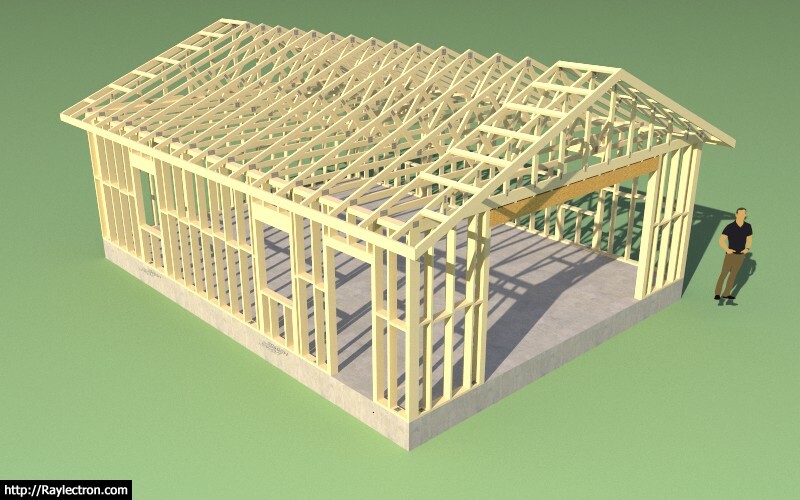 - Added fillet radiuses to wide flange (W) and universal (UB) beams. 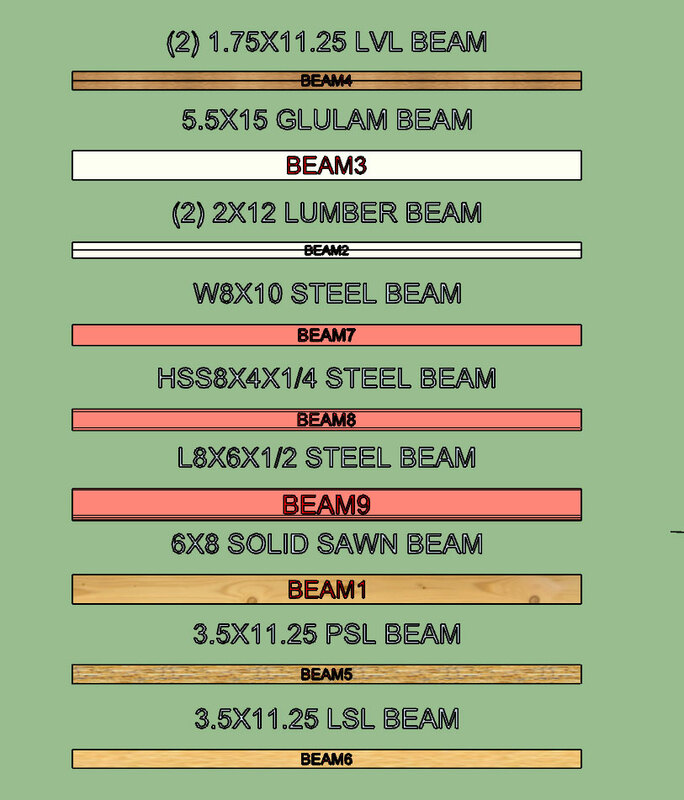 Nine different beam types with two series of wide flange beams (W and UB). 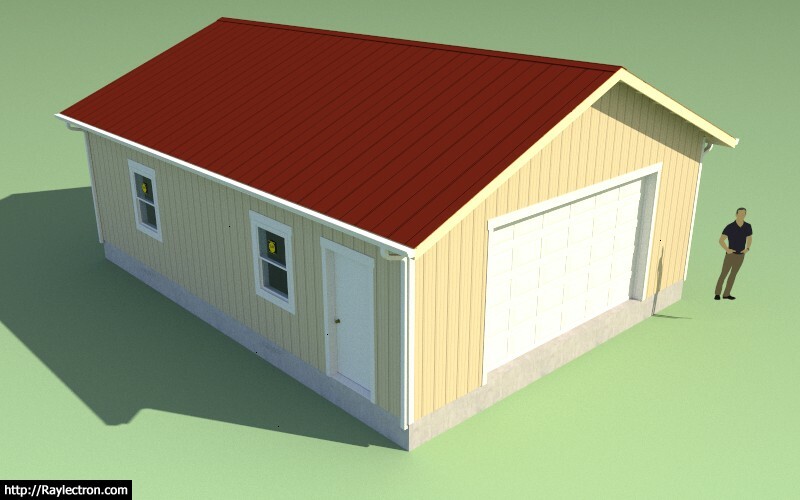 Aside from residential structures one could also use the beam module to create various structural steel assemblies, however that is not really the purpose or target audience for this module. I added the fillets to the wide flange profiles per customer requests. The primary reason for including this information it to better predict and check bolt patterns that are on the web of the beam(s). Fillet radiuses are per the various standards. I haven't take the time yet to add in the few hundred standard sizes from my steel manual but as time allows I will continue to populate these fields. 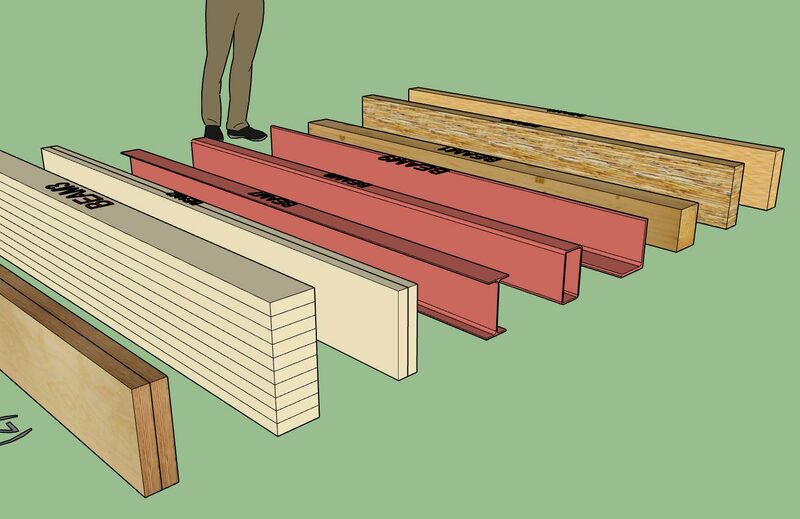 Also if there is specific requests for sizes or series of beam types I will accommodate those requests.